Protect our bats by not disturbing them. Never approach or handle a bat. This is a disease in hibernating bats caused by the fungus Geomyces destructans. The disease gets its name from white fungus that appears on the muzzle and other body parts of infected bats. The fungus causes skin erosion and abnormal bat behavior leading to death. 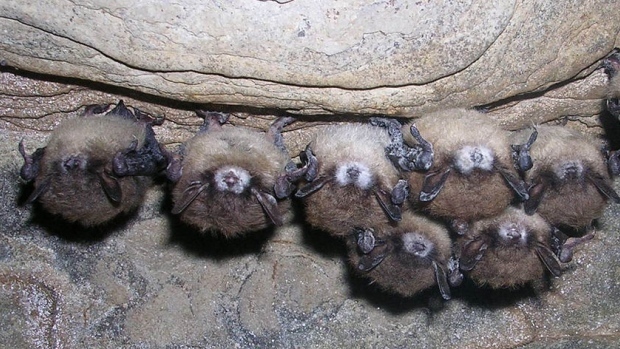 The disease causes bat mortality through abnormal behavior during winter hibernation months including flying outside during the day and clustering near the entrances of caves. These behaviors deplete the bat’s fat stores causing death due to the elements. 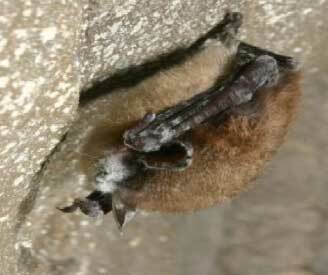 The disease primarily affects winter hibernating bats. It is present in habitats that have the following bats: Big brown bat, Eastern small-footed bat, Indiana bat (currently endangered), Little brown bat, Northern long-eared bat and Tricolored bat. Bat winter hibernation roosts including caves and mines. Was confirmed in an abandoned mine in Cass county, Nebraska in 2015. Is found in many eastern state. View location map. The disease was first found in New York City in the winter of 2007. The disease came to the United State from Europe. The disease is spread from bat to bat contact. The disease is estimated to have caused bat population declines in the northeastern US since it emerged at approximately 80%. Bat species affected by the disease are unlikely to recover quickly due to long life spans and only birthing a pup per year.